Our classic “Mom & Pop” establishment offers traditional Motel lodging with a personal touch. You will find 16 clean, comfortable and modern rooms with all the amenities in a beautiful small town country setting. All rooms include: * Air Conditioning * Smoke – FREE * Cable TV w/remote * In-Room Coffee * Refrigerator and Microwave * Pet friendly *limited rooms * Wi-Fi Internet Access. We are less than 30 min from Traverse city and only 15 min from Interlochen, Frankfort, Empire and the Sleeping Bear Dunes area. 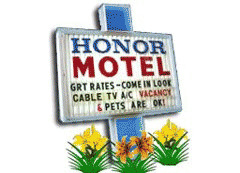 Below are the latest postings from the Honor Motel Page On Facebook. Honor Motel shared a post.